Cookies… cream… and 21g of protein! Revel in the taste of cheat day treats and the delight in knowing you’re cheating clean! With 21g of protein and 5g net carbs*, you’ll be pinching yourself after every bite. (No, you’re not dreaming) *7g Carbs – 2g Erythritol = 5g Net Carbs. Each bar is 60g. Every delicious Quest Bar flavour has 20-21 grams of protein and plenty of fibre without a lot of unnecessary ingredients or extra carbs. All Quest Bars are gluten and soy free, and contain no added sugars*. Quest Bars are helping us inspire a global #CheatClean revolution, reframing the conversation around nutrition. This is the bar that promises food can taste as good as it is good for you. With Quest Bars, you can eat toward your goals and love every bite along the way. *Trivial amount of naturally occurring sugars from different ingredients. Protein Blend (Milk Protein Isolate, Whey Protein Isolate (Milk)), Soluble Gluco Fibre, Almonds, Water, Chocolate Flavour Cookies (10%)(Protein Blend (Whey Protein Isolate (Milk), milk Protein Isolate)), Dextrin, Cocoa, Cocoa Butter, Flavouring, Emulsifier (Sunflower Lecithin), Coconut Oil, Thickener (Xanthan Gum), Rising Agent (Baking Soda), Sea Salt, Sweetener (Sucralose)), White Chocolate Flavour Chunks (5%) (Cocoa Butter, Milk Protein Isolate, Bilking Agent (Erythritol). 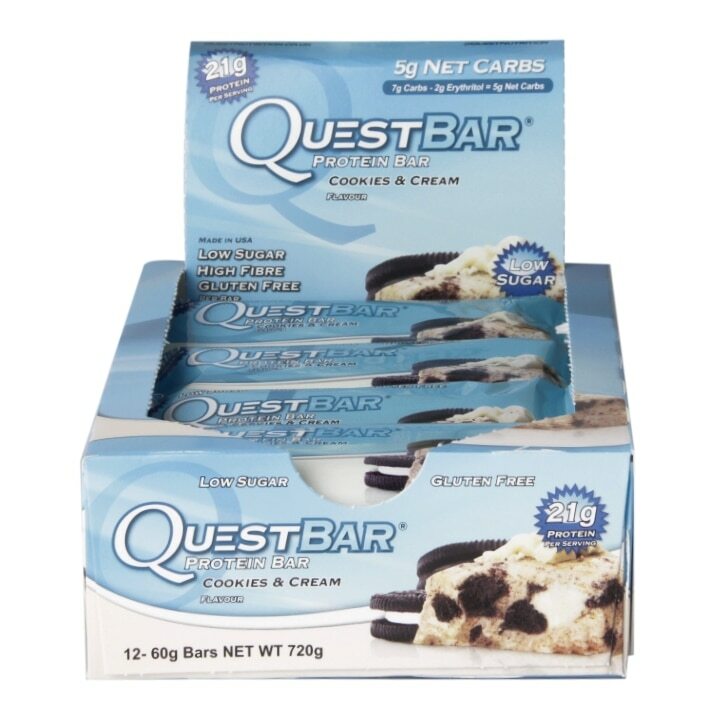 Quest Protein Bar Cookies And Cream is rated 3.7 out of 5 by 11. Rated 5 out of 5 by Izzygrace from Yummy Tasted really good unlike some 'cookies and cream' protein bars. Slightly pricey for an individual bar but a nice treat after a workout. Rated 4 out of 5 by Kh92 from Absolute staple in the snack drawer Perfect sized bar with beautiful chunks! Delicious no matter what time of day and even better when heated up slightly. Firm 8/10!